I’m not going to lie, folks. I’m all about the bah humbug. But, in keeping up with the kids, I’ve set out to find some ways to make my grinch heart grow. I think I can revive my holiday spirit while staying true to my inner penny-pinching Scrooge. As usual, it’s Mother Nature rushing in to save the day with her awesome collection of craft materials, seasonal family outings and beautiful landscapes. But, as with any season, winter has it’s drawbacks – which we’ll tackle with tips for bundling up and warming up after hikes through the snow. 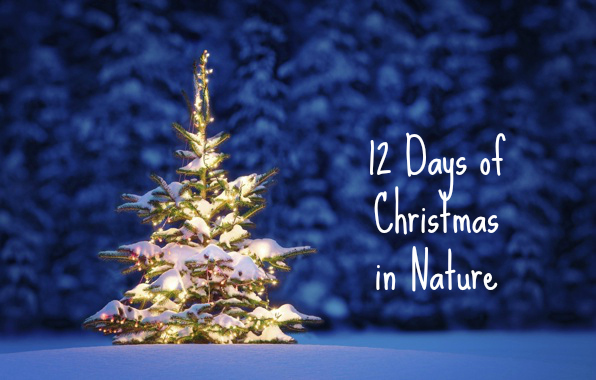 For the 12 days of Christmas, beginning December 1st, I’ll be sharing fun and interesting ways to spend time with nature this holiday and winter season. Make sure you don’t miss a thing by subscribing to my “Trail Mix Digest,” in which I’ll also be releasing a Winter Nature Journal eBook. I’m delighted to say that I was inspired to write the “12 Days of Christmas in Nature,” by my good friend at 365 Atlanta Family, Lesli Peterson. Thanks Lesli for letting this grinch borrow your idea and make it my own!